The organizers were the Pacific Asia Travel Association (PATA) in collaboration with the Asian Development Bank (ADB) and the Economic and Social Commission for Asia and the Pacific (UNESCAP), while the forum was being hosted by the Kingdom of Cambodia’s Ministry of Tourism. 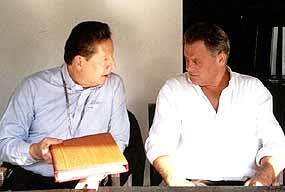 Luzi Matzig and Armin Schoch (Impulse Travel Chiang Mai), both pioneers in the Mekong region, representing the private sector during MTF2005 in Siem Reap. For PATA Vice President-Development Peter Semone, the outcome of the forum was clear. He outlined that the success in sub-regional co-operation during the last 10 years - ever since the MTF was inaugurated at Pattaya in 1996 - will serve as a solid foundation in charting the countries of the Greater Mekong sub-region (GMS) for another next ten years. The countries of the GMS comprise now Cambodia, China, Lao PDR, Myanmar, Thailand, and Vietnam. One emerging problem to overcome was that both organizations, which helped fund the MTF, are not supporting it anymore financially. ADB as well as UNESCAP stated uncompromisingly that the event must be self-funding in the future. Consequently, it is now up to the private sector to sponsor the event. So far, it is only Bangkok Airways and Thai International, which both signaled a kind of continuing role to support the forum to bring the delegates to where they want to go. 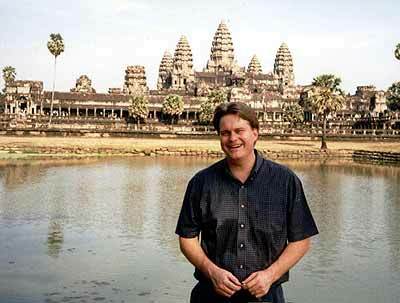 PATA’s Peter Semone is all smiles in front of Angkor Wat in Siem Reap. It was up to the energetic representative of ADB, Alfredo Perdiguero, project economist of the Social Sectors Division, Mekong Department to hammer out a commitment in principle amongst the attending GMS National Tourism Organizations (NTOs). This commitment includes promoting the GMS as a single destination, implementing the GMS Tourism Sector Strategy and Action Plan, and attending the Tourism Working Group Meeting at least once a year. Furthermore, there will be a new Mekong Tourism Coordinating Office (MTCO) established to assist the Tourism Working Group in the implementation of the strategy consisting of 27 projects and the raising of funds from the private sector and development partners to support it. The MTCO will initially be based at the Ministry of Tourism and Sports in Bangkok and could be moved to another GMS country after a period of three years. The financial contribution towards the cost of maintaining the MTCO including the recruitment of a full time Executive Director, Program Officer and secretary is USD 90,000 per annum, to start operation on January 1, 2006. Subsequent contributions shall be based on a “formula” to be worked out by the Executive Director and approved by the Tourism Working Group. According to the view of the private sector, the Executive Director should come from outside the GMS countries. It is understood that this agreement will be subject to the approval of the relevant higher authorities in the governments of the six GMS countries. The relevant ministers of the GMS countries will meet next at Kunming, Yunnan in July 2005. Also, it was agreed that the next meeting of the Tourism Working Group is at Luang Prabang/Laos in March 2006 and that the 11th MTF will be held at Pattaya in April 2006 in conjunction with the PATA Annual Conference. PATA’s Peter Semone offered this elegant solution to bridge the transitional stage to save the forum for 2006. Going to Singapore during the month of April can be a feast for your eyes, as well as for your ears and your tummy, with festivals lining up from fashion, to gourmet, to art and films. The diversity in Singapore is endless. Crunchy ‘Ya Kun Kaya Toast’ is toasted on charcoal before it gets buttered and filled with the sweet yam. The stunning new Esplanade theatre/concert hall/opera house/art complex, whatever name you choose is entirely up to you, where you can take in one of the world’s most beloved Broadway musicals, ‘The Sound of Music’, imported directly from New York. Ticket prices range from S$ 32 - 158 per person. 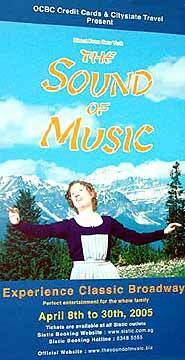 The Sound of Music is guaranteed to captivate audiences with its all time favorite hits, including ‘Do-Re-Mi’, and ‘Edelweiss’. At the futuristic Esplanade, with its 300 meter Waterfront area, there is always something happening. Either at the 2000 seat theatre, spread over four levels in an intimate horseshoe-shape configuration, or at the 1,600 seat concert hall, with noteworthy features such as acoustic curtains and canopies to adapt the hall to all types of music maximizing clarity and sound. Should you get caught in one of the almost daily thundershowers of Singapore, don’t worry, there will definitely be at least one exhibition inside the Esplanade as their mission is to entertain, engage, educate and inspire the visitors. Now what about your taste buds? It is hard to choose in Singapore as the choice is so varied and international. From international hotel dining to satay stalls along the streets, from the colorful intimate restaurants at Clarke Quay to the huge seafood restaurants, everything is there. Make sure to start one of your early mornings with ‘the toast of the town’, or better known as ‘Ya Kun Kaya Toast’. The first ‘Ya Kun Kaya Toast’ Coffee stall was founded by an immigrant from Hainan Island in 1944 but has developed into a franchise breakfast business with over 15 outlets in Singapore. Check with the concierge of your hotel for one nearest you. 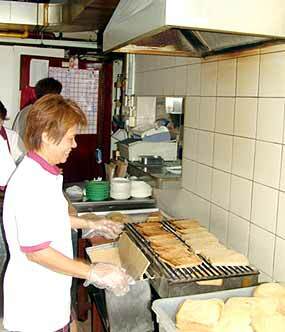 A typical traditional Singapore breakfast consists of crunchy kaya toast, soft-boiled eggs and sweet coffee. The recipe is a secret but the thin and crispy toasts are filled with butter and kaya, a jam-like custard made from milk, sugar and pandan leaves. The Esplanade is not a building but an architectural statement. 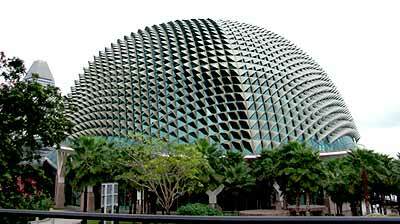 The exterior will remind you of a huge Durian, and in fact, is its common name among Singaporeans. The roofline serves as a shield from the sun and each ‘spike’ is designed to redirect the sunlight. While you stroll through Chinatown, don’t be afraid to try some of the fresh grilled beef and pork jerkies. They are fresh, soft, crisp, sweet and slightly spicy. Very elegant, very special, yet also very relaxed are the dining and wine choices at Chijmes. The historic Chijmes hall is now used as a multi-function venue for weddings, selective performances and recitals. 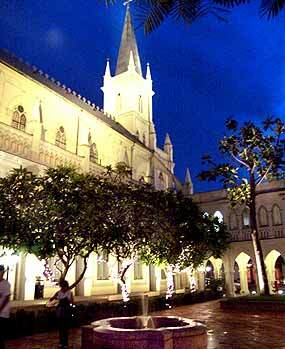 In the evening, when it is time to relax, don’t overlook the ‘Chijmes’, an old Catholic girls school and a former chapel in the heart of the Civic and Cultural District. A couple of years ago it was transformed to a lifestyle recreational landmark and offers a broad spectrum of restaurants and music pubs. 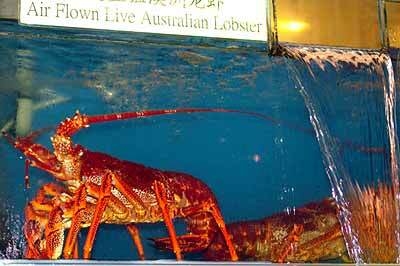 The cuisine varies from American and Cantonese to French, Italian, Japanese and Spanish. The historic Chijmes hall (former church) is now used as a multi-function venue for weddings, performances and recitals and is a fine example of people appreciating the restoration of old historic buildings rather than abandoning or replacing them. But whatever your choice will be, you will never get bored in Singapore.